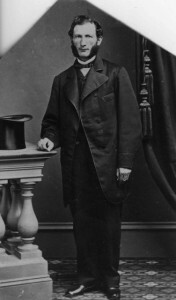 Harris Newmark was born in Loebau, West Prussia, in 1834. He profited from early youth by traveling with his father, Philip Newmark, to neighboring countries selling a special type of printer’s ink. 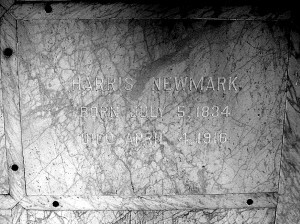 Harris Newmark came to Los Angeles in 1853, at the age of 19, by way of New York, crossing Nicaragua to get to San Francisco, then sailing south to Los Angeles. At the Port of San Pedro he was met by the Harbor Master, Phinias Banning, who became a lifelong friend and associate. He was not the first of his family to come to Los Angeles. His brother, Joseph P. Newmark had arrived two years earlier. 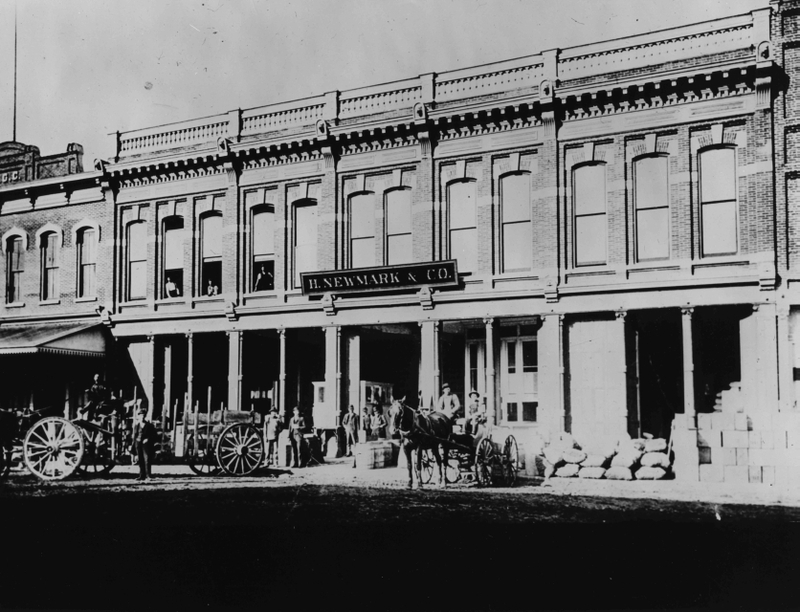 Harris Newmark worked as a clerk in his brother’s wholesale clothing store until Joseph P. Newmark gave up the business in 1854 to become a commercial broker and moved to San Francisco. 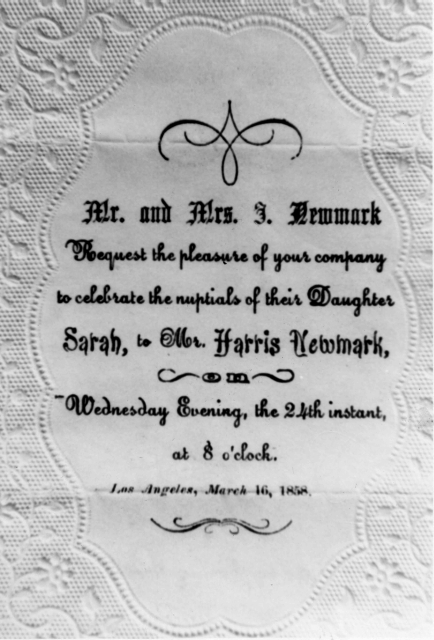 Harris Newmark continued in the wholesale clothing business until 1861, when he, too, decided leave the business because of its long hours. He became a broker, focusing on hides and wool. 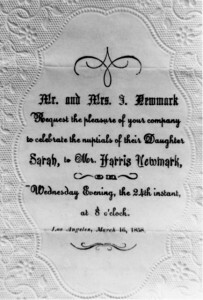 While still in the clothing business, Newmark convinced his nephew, Kaspare Cohn, to come to America and work with him. When Harris’s uncle, Joseph Newmark (no ‘P.’), arrived in 1854, young Harris moved in with him. One bonus was that his aunt, Rosa Newmark, helped him learn English. Shortly after his arrival in Los Angeles, the Hebrew Benevolent Society was established as the first organized charity in the Los Angeles. 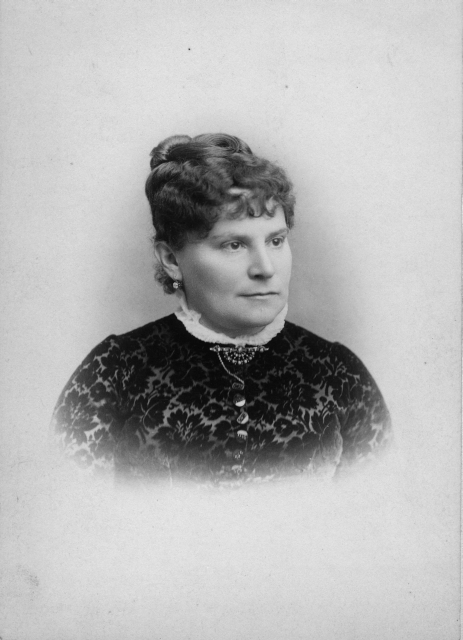 When the Ladies Hebrew Benevolent Society began in 1870, Harris Newmark became one of its three advisors. Harris also supported the Jewish Orphans Society, which was the beginning of the organization now known as Vista del Mar. 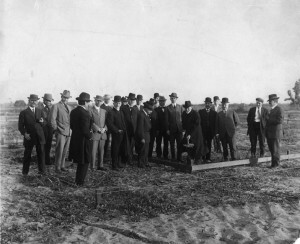 Harris Newmark had the honor of digging the first shovel of dirt for the groundbreaking of the Jewish Orphan’s Home of Los Angeles. Harris Newmark was a founder of the original Los Angeles Public Library. He was a Charter Member of the Los Angeles Chamber of Commerce. He also helped found the Los Angeles Board of Trade, which was responsible from bringing the railroad to Southern California. He was a major factor in the development of the Southwest Museum, created by his close friend Charles Loomis. The magnificent collection of the Southwest Museum was recently “rescued” and is being refurbished by the Autry National Center. Harris Newmark was a leader in both the Odd Fellows and Masonic Lodge. When Newmark tired of the confines of the wholesale business and became a broker of hides and wool, he rapidly became the key figure in the trade in Los Angeles, shipping hides and wool to customers around the world. In 1872, he and his cousin, Kaspare Cohn, purchased the Santa Anita Ranch of 8,000 acres for $85,000. A short time later they sold it to “Lucky” Baldwin for $200,000 in cash. They then purchased land on what we now know as Wilshire Boulevard, as well as beachfront property in Santa Monica, when it first opened for development. 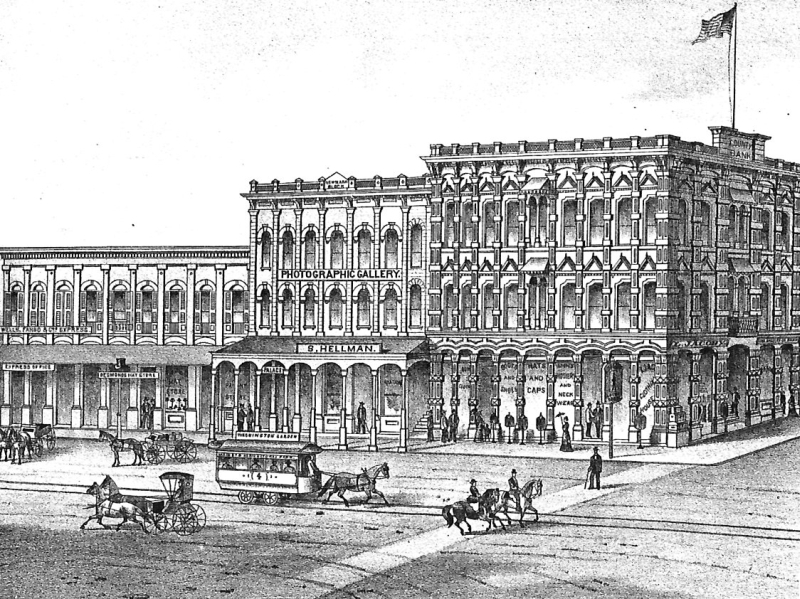 In 1877, Harris Newmark purchased the Temple Block, a “towering structure” of three stories at Temple and Main Streets. He sold the building to the city as the site for a new City Hall. Wanting to see the city grow, Newmark was active in encouraging the Southern Pacific Railroad to construct tracks to Los Angeles. By 1882, the telephone had been introduced to Los Angeles. H. Newmark & Company subscribed immediately and was given the number 5. The Newmark “Block” is the square building in the middle, not the entire city block. 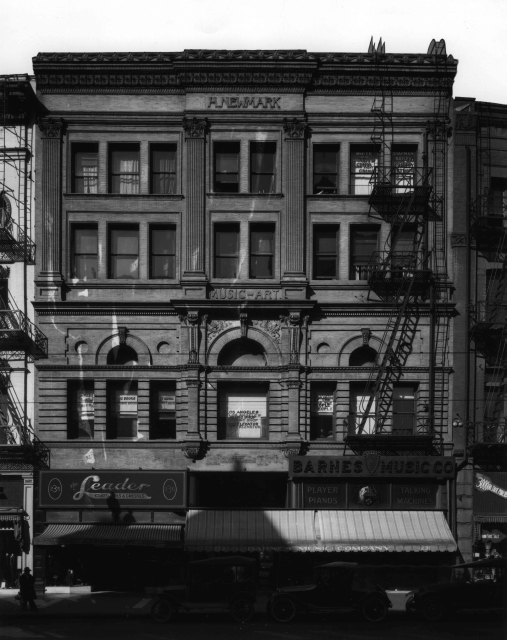 Note that S. Hellman’s Stationary Store, where Isaias Hellman worked as a newcomer, is on the ground floor of the Newmark Building. 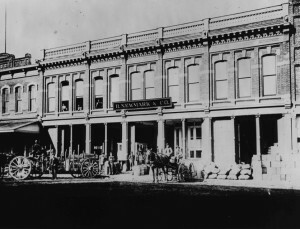 Desmond’s Store, which became the Desmond’s Department Stores, is left of the Newmark Building, and Jacoby Bros., another major retailer, is in the larger building on the right. Lithograph, c. 1880’s. Harris Newmark’s most lasting contribution to Los Angeles is his book, Sixty Years in Southern California 1853-1913, published in 1916. His two sons edited the book and brought it to press. It is one of the most important sources of Los Angeles history, and reads well today. Much of the material in our Los Angeles Exhibition Hall has been drawn from Newmark’s book. 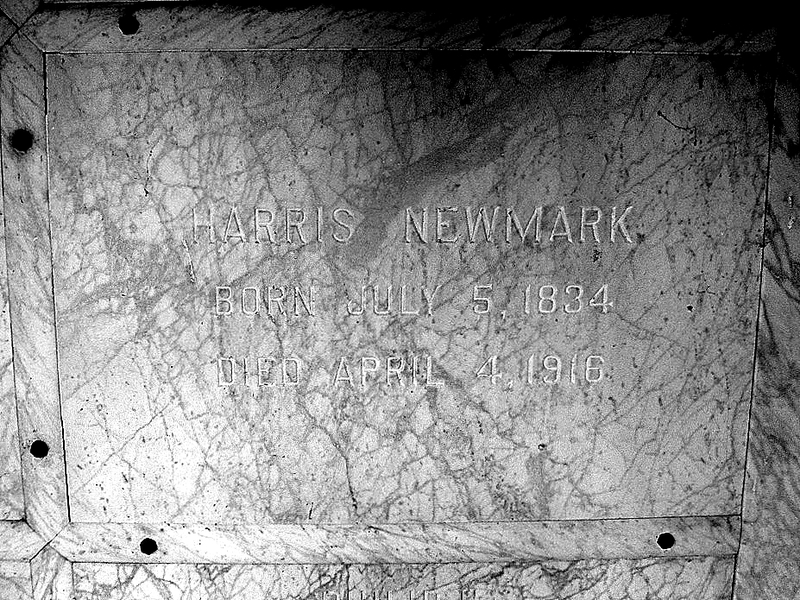 Harris Newmark died in Los Angeles in 1916 and is interred at the Home of Peace Cemetery in East Los Angeles. J. 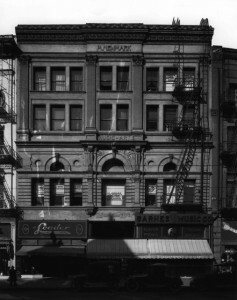 A. Graves, “Harris Newmark: Did the Jews Destroy a Los Angeles Bank in 1875?,” Western States Jewish History 38 3&4. 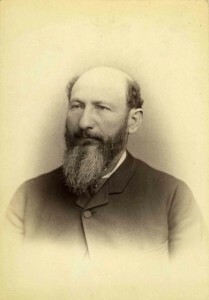 Norton B. Stern and William M. Kramer, “Harris Newmark: Leading Citizen of Los Angeles for 60 Years, 1834-1916,” Western States Jewish History 38/3&4. Dr. Harris Newmark, III, ed. “Historical Quotes by Harris Newmark,” Western States Jewish History 38/3&4. Norton B. Stern, “Remembering Los Angeles Jewish Pioneers: Harris Newmark and Isaias W. Hellman,” Western States Jewish History 29/4. Norton B. Stern, “Saraha & Harris Newmark,” Western States Jewish History 41/3. William M. Kramer, “Harris Newmark: Pioneer Merchant and Historiophile, Los Angeles, 1896,” Western States Jewish History 42/2-3. Harris Newmark, Sixty Years in Southern California, 1853-1913, edited by Maurice H. and Marco R. Newmark (New York: Knickerbocker, 1916).